My WordPress user name and online identity are taken from Shakespeare’s Julius Ceasar. 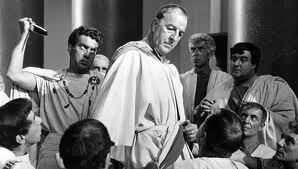 In Act III–just before Caesar is killed–one of the characters calls another character “Sirrah,” as a term of address directed at an inferior. I took this word and added an extra “h” at the end, in order to approximate a feeling of satisfaction, as after having drank a really good beer. “Sirrahh” had an appeal to me, and so I took it as my own. You don’t get to do that when you’re born, but the Internet provides the opportunity to pick your own online name. If your online alias has any funky meaning, please tell me about it below. And thanks for reading, as ever.